When it comes down to real estate essentials, it’s all about location. For college students searching for prime student apartments near the University of Akron, location is even more important — specifically, what’s within a reasonable walking distance. Whether you’re an international student traveling to the United States without a car or you’re local to Akron but you just don’t want to deal with the hassle of parking, we understand. 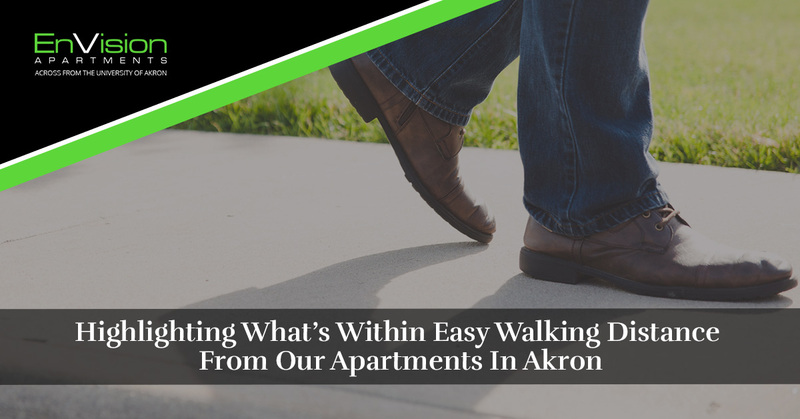 That’s why today’s blog post is dedicated to covering some of the closest businesses to our Akron apartments! Feel free to learn more about the best pet-friendly student apartments in Akron by visiting here or contacting The EnVision Apartments if you have any questions. Let’s get started. Looking for a quick bite to eat when you’re on-the-go in between home and class? Stop by The Crystal Room Bistro for a variety of excellent food choices made by students, for students. Located in Gallucci Hall on Grant Street, this restaurant is operated by Hospitality Management students and supervised by the professional faculty at UA’s Hospitality Management Program. Here, you’ll enjoy homemade soups, salads, wraps, wings, quesadillas, specialty sandwiches, paninis, and various daily lunch specials. If you’re of age, then you’ll be delighted to know that there’s a brewery located just down Grant Street from our Akron apartments. Complete with a full menu at their TapHouse, Thirsty Dog Brewing Co. offers year-round beers, seasonal specialties, limited release beers, barrel-aged beers, and barrel-aged sours. With nine year-round beers on tap and plenty more rotating beers to try, you’ll never be thirsty. For even more beer, give their neighbors, Aqueduct Brewing, a try. Did you forget something on the way to class? Is it not worth the short walk back to your apartment? Worry not, because Zee’s Convenience Store is here for you. Conveniently located at the Exchange Residence Hall just up Grant Street, you’ll find an array of pastries, prepackaged snacks, deli items, coffee, and other bottled beverages designed for on-the-go use. After a couple of hours spent working hard at the gym on top of studying for your next exam, why not undo all of your fitness progress with a well-earned meal at Steak n’ Shake? This diner-like space with a bit of a retro flair throws you back in time, and their milkshake and steakburger combo will not disappoint. If you’re in search of something with a little more cheese than Steak n’ Shake, a walk in the opposite direction down to Thornton Street will land you at East of Chicago Pizza. Famous for their build-your-own Chicago-style deep-dish pies, they also offer wings and subs to satisfy those academic hunger pains. We recommend hitting a brewery or two on the way down to here! First and foremost, your number one priority is being a student and furthering your career at the University of Akron. That means that you shouldn’t have to spend precious time walking miles and miles just to get anywhere. When you join us at our Akron apartments, you won’t have to! Lock down on your own space before next semester by applying today.